It's finally turned cloudy again just the way our trip started. The good news is that's it a balmy 52 degrees out although the forecast is for the temperature to drop tonight. In fact it dropped four degrees by the time we got packed up to leave. We started off heading northeast toward Portland, Oregon about 138 miles away. 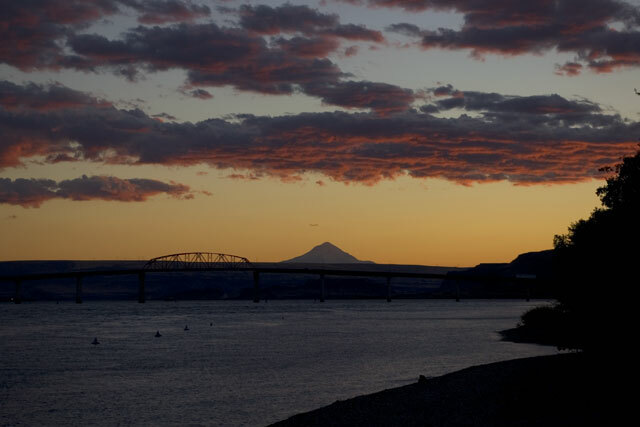 There's a state park on the Washington State side of the Columbia River we want to check out. Believe it or not the weather just kept getting better and better the further we went. After some more canyons and sage brush we started to get into pine trees and hills. The trees got thicker and before you knew it we were into the Cascade Mountain Range. While the area we were leaving had its own beauty and interesting landscapes it was really good to get back into real mountainous country. Near Mount Hood we stopped and checked out the Wilderness Lodge made famous in the Jack Nicholson movie, The Shinning. If you've seen the movie you'll remember that it takes place at a big lodge in the mountains. 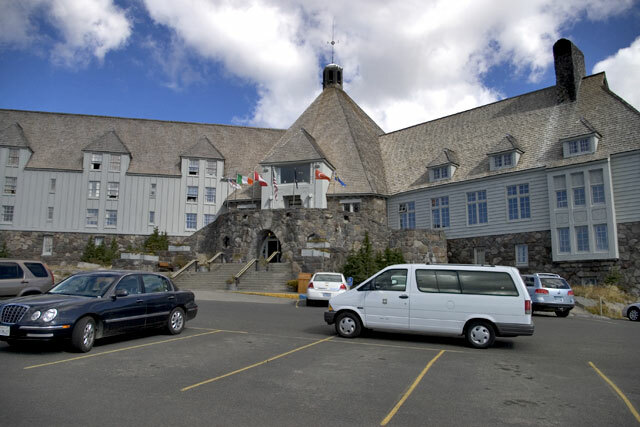 If you've never been to the lodge you'll probably be disappointed to find out that only the exterior of the building was used in the movie. There are no ballrooms, no wide hallways and no maze in front. It's just a big lodge sitting right next to Mount Hood. 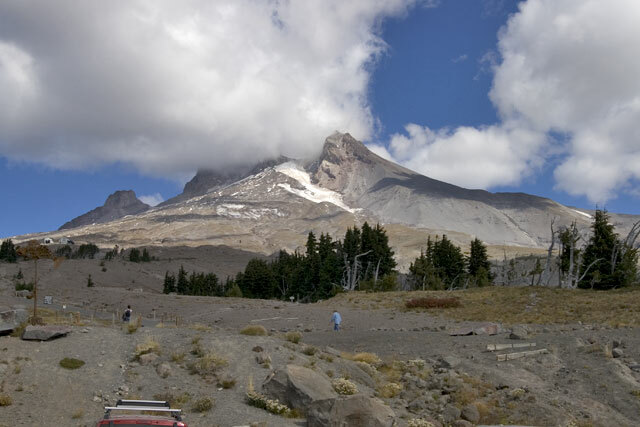 It is beautiful and sits high up with a magnificent view of not only Mount Hood but miles and miles south along the Cascade Range and Eastern Oregon. It's well worth a stop. 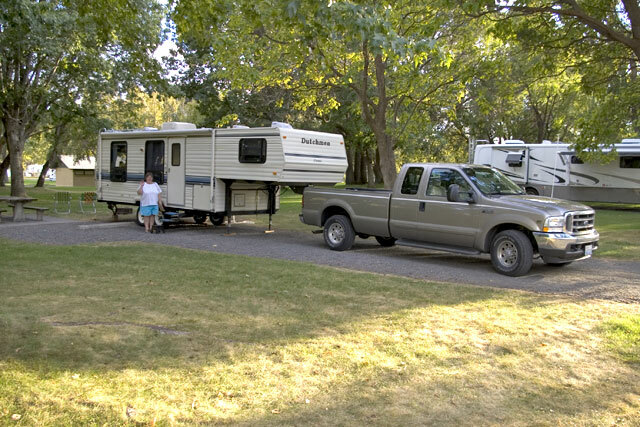 We drove by the campground on the north side of the Columbia River and it was just too busy of an area and we kept on heading east to find something on the river but further out. Well we certainly did find something further out. After another 112 miles we came to Maryhill State Park right on the Columbia River. Of course we had passed right back over the Cascade Mountain Range and were back in the sage brush and shear canyon walls. The park is very nice but very busy; we got one of the last three spots available. There is lots of grass and the spots are very spacious. It would have been nice to have a spot on the river but they were all taken. There was nothing but sunshine and around 73 degrees. After we got set up we headed for Stonehenge. 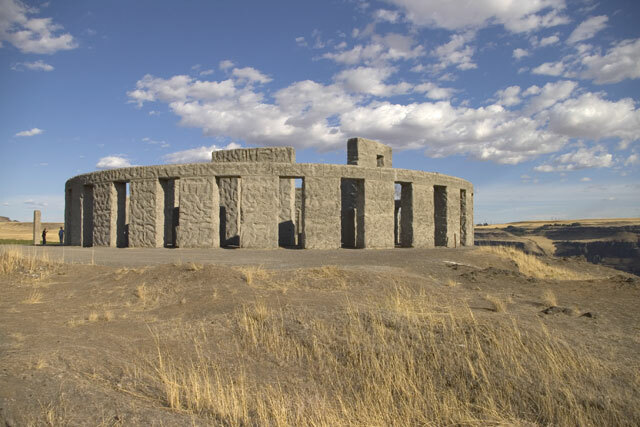 Yep just a few miles away from the campground is a full size replica of Stonehenge. It is not like the ruins by the fact that Sam Hill made it like the original would have been before time took its toll. It was built in 1918 as a war memorial for the fallen solders of World War I. In fact it was the first war memorial built in the country to honor those solders. Just a couple of miles away is the Maryhill Mansion and Museum. Sam Hill built it for his wife in the early 1900's but she never lived there. She thought it was ugly, which it isn't, and in the middle of nowhere, which it is. The museum was closed for the day so we didn't get to see it. Instead we opted for the Maryhill Winery just another five miles up the road. 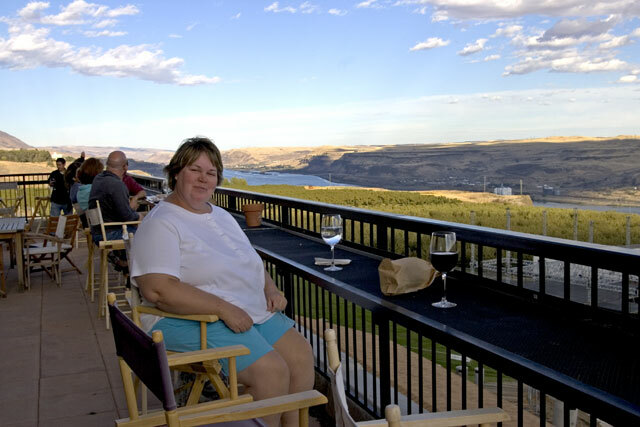 It's a pretty little winery with a sweeping view of the Columbia River. After some wine tasting we selected a wine and headed out onto their patio for a glass. There's a large grassy area below the winery where they have concerts in the summer. They get some of the greatest names in blues such as B. B. King and Eric Clapton. It would be great to attend one of their concerts. After dinner, back at camp, we went for a walk to the Columbia river. There was a beautiful sunset happening so we just sat on some rocks and let it happen. The only down side to this campground is the railroad train that runs behind it. There is also a railroad track on the other side of the river which you can hear. They didn't seem to be too bad during the night but if you are a light sleeper they could get to you.